Fresh plans for a new block of flats to meet a rising demand for homes in Bournemouth have gone on show to the public. The proposed scheme is a five-to-six-storey building of 44 apartments, replacing a car park at Durley Road to the west of the town centre. There is a mix of one, two and three-bedroom flats plus residents’ parking. The homes will be for market sale and aimed at first-time buyers, young professionals, downsizers and families. The £13 million scheme is being brought forward by the Bournemouth Development Company, a joint venture between Bournemouth Council and Morgan Sindall Investments. A previous application for conditional planning permission was turned down in summer 2017 on grounds of design and loss of parking. Since then, work has been under way on a revised proposal incorporating changes to architectural features and articulating a comprehensive range of parking mitigation measures and alternative transport solutions. 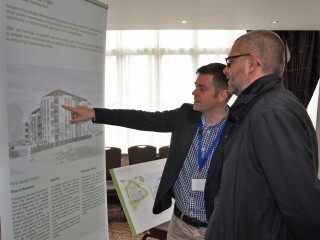 The exhibition of plans, at the nearby Hallmark Hotel Bournemouth West Cliff, gave members of the public the chance to question project team architects and consultants in transport planning. Following the exhibition and further consultation, a full planning application is expected to be submitted in 2018 ahead of more detailed design work. The Durley Road car park has been designated for residential use in Bournemouth Council’s Area Action Plan for several years. Got any questions? Let us know what you think and send us a comment!